For other uses, see Smaug (disambiguation). Smaug (/smaʊɡ/) is a dragon in J. R. R. Tolkien's 1937 novel The Hobbit. He is a powerful and fearsome dragon that invaded the Dwarf kingdom of Erebor 150 years prior to the events described in the novel. A group of thirteen dwarves mounted a quest to take the kingdom back, aided by the wizard Gandalf and the hobbit Bilbo Baggins. Smaug is described as "a most specially greedy, strong and wicked worm". In Appendix A, section III, of The Return of the King, dragons are stated to reside in the Withered Heath beyond the Grey Mountains. Smaug is described as "the greatest of the dragons of his day", and was already centuries old at the time he was first recorded. Having heard rumors of the great wealth of the Dwarf-kingdom of Erebor, he "arose and without warning came against King Thrór and descended on the mountain in flames". After driving the Dwarves out of their stronghold, Smaug occupied the interior of the mountain for the next 150 years, guarding a vast hoard of treasure. "The Quest of Erebor", a chapter of Unfinished Tales, recounts how Gandalf realized that Smaug could pose a serious threat if used by Sauron. He therefore agreed to assist a party of Dwarves, led by Thrór's grandson Thorin Oakenshield, who set out to recapture the mountain and kill the dragon. Assuming that Smaug would not recognize the scent of a hobbit, Gandalf also recruits Bilbo Baggins to join the quest, which is the subject of The Hobbit. 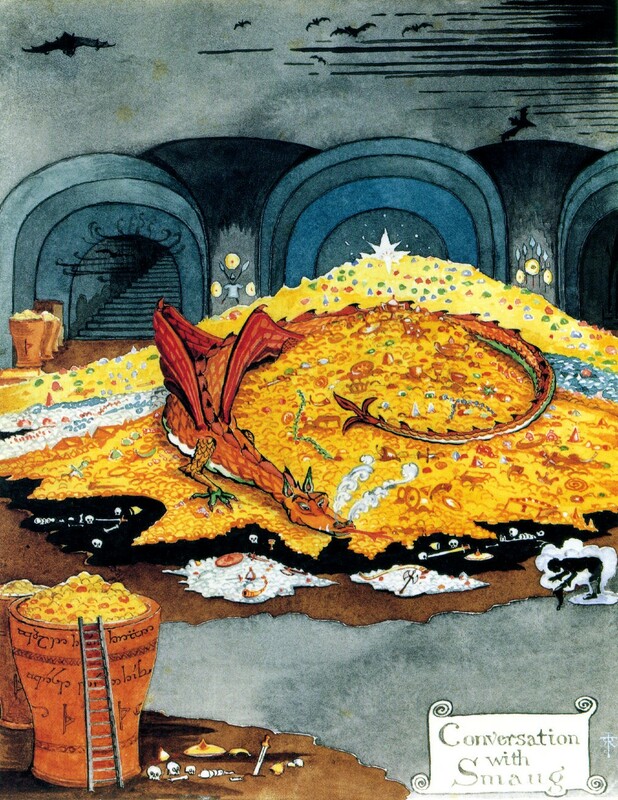 Upon reaching Erebor, the Dwarves sent Bilbo into Smaug's lair, and he was initially successful in stealing a beautiful golden cup as Smaug slept fitfully. 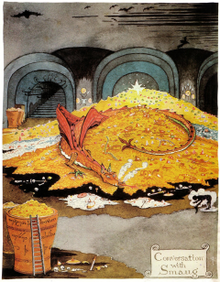 Knowing the contents of the treasure hoard which he had slept upon for centuries to the ounce, Smaug quickly realized the cup's absence upon his awakening and sought for the thief on the Mountain. Unsuccessful, he returned to his hoard to lie in wait. Having been nearly killed in the dragon's search, the Dwarves send Bilbo down the secret tunnel a second time. Smaug sensed Bilbo's presence immediately, even though Bilbo had rendered himself invisible with the One Ring, and accused the Hobbit (correctly) of trying to steal from him. During his discourse with the dragon, Bilbo detected a small bare patch in the jewel-encrusted underbelly of the dragon. When Bilbo narrowly escapes an attack from the dragon and collapses amidst the Dwarves at the entrance to the secret tunnel, a thrush overhears Bilbo's frantic retelling of his interaction with the dragon and learns of the bare patch on Smaug's underside. This becomes important later when Bard the Bowman kills Smaug during the dragon's attack on Laketown by shooting an arrow into this bare patch, mortally wounding him. Tolkien created numerous pencil sketches and two pieces of more detailed artwork portraying Smaug. The latter were a detailed ink and watercolour labelled Conversation with Smaug and a rough coloured pencil and ink sketch entitled Death of Smaug. While neither of these appeared in the original printing of The Hobbit due to cost constraints, both have been included in subsequent editions, particularly Conversation with Smaug. Death of Smaug was used for the cover of an early UK paperback edition of The Hobbit. From 1925 to 1945, Tolkien was a professor of Anglo-Saxon at Oxford University, and a prominent critic of and expert on Beowulf — on which he gave a lecture at the British Academy in 1936 and which he described as one of his "most valued sources" for The Hobbit. Many of Smaug's attributes and behaviour in The Hobbit derive directly from the unnamed "old night-scather" in Beowulf: great age; winged, fiery, and reptilian form; a stolen barrow within which he lies on his hoard; disturbance by a theft; and violent airborne revenge on the lands all about. Smaug was intimately familiar with every last item within his hoard, and instantly noticed the theft of a relatively inconsequential cup by Bilbo Baggins. Tolkien writes that Smaug's rage was the kind which "is only seen when rich folk that have more than they can enjoy lose something they have long had but never before used or wanted." This theft of a cup, Smaug's knowledge of every item in the hoard, and the dragon's ensuing rampage, all echo the story of Beowulf. Tolkien may also have been inspired by the talking dragon Fafnir of the Völsunga saga. Like many dragons in Nordic and Celtic mythology, Smaug embodies greed and the calamities it causes. Tolkien noted that "the dragon bears as name—a pseudonym—the past tense of the primitive Germanic verb smúgan, to squeeze through a hole: a low philological jest." The name also bears a remarkable similarity to the Slavic word for dragon, smok. Smaug was depicted by Tolkien as an intelligent being capable of speech, easily pleased by flattery and fascinated by Bilbo's description of himself in riddles. This is also portrayed in later film adaptations such as The Hobbit: The Desolation of Smaug. He is described as having "quite an overwhelming personality"; every time his eyes flash across Bilbo's invisible form, he feels almost compelled to tell him the truth about himself because of the hypnotic power within. On June 16, 2011, it was announced that Smaug would be voiced and interpreted with performance capture by Benedict Cumberbatch in Peter Jackson's three-part adaptation of The Hobbit, wherein Smaug is presented with a long head, red-golden scales, and piercing yellow-red eyes. The dragon speaks with Received Pronunciation with an underlying growl; Cumberbatch's vocal performance was vocoded using alligator growls. Smaug's design was animated with key frame animation, in addition to Cumberbatch's motion capture performance. Weta Digital employed its proprietary "Tissue" software, which was honoured in 2013 with a "Scientific and Engineering Award" from the Academy of Motion Picture Arts and Sciences to make the dragon as realistic as possible. In addition, Weta Digital supervisor Joe Letteri said in an interview for USA Today that they used classic European and Asian dragons as inspirations to create Smaug. In the first film, The Hobbit: An Unexpected Journey, the audience sees only his legs, wings, and tail, and his eye, which is showcased in the final scene of the film. Smaug is a topic of discussion among the White Council as Gandalf's reason to support Thorin Oakenshield's quest. Smaug appears as the titular primary antagonist in the second film, The Hobbit: The Desolation of Smaug. In an interview with Joe Letteri, Smaug's design was changed to this form after the crew saw how Benedict Cumberbatch performed Smaug while moving around on all four limbs. The weak spot shown in Smaug's armour is the result of one of his scales breaking off during his attack on Dale. He makes veiled references to the One Ring and a "coming darkness" which tie in to the film's secondary plot concerning the resurgence of Sauron. Smaug battles Thorin's small group of dwarves when they come to Bilbo's aid, before flying off to Lake-town. In The Hobbit: The Battle of the Five Armies, Smaug attacks Lake-town. He is killed by Bard with an elongated iron arrow and his body falls on the boat carrying the fleeing Master of Lake-town. It is later revealed that Smaug's attack on Erebor was all part of Sauron's design, meaning that Smaug and Sauron were in league with each other. Smaug was considered one of the highlights of the second film of the series, with several critics hailing him as cinema's greatest dragon. Critics also praised the visual effects company Weta Digital and Cumberbatch's vocal and motion-capture performance for giving Smaug a fully realized personality. In the 1977 "J.R.R. Tolkien Calendar", the Brothers Hildebrandt depicted Smaug with bright red scales and large bat-like wings. In the 2003 video game release, Smaug was voiced by James Horan. Francis de Wolff voiced the red dragon in the long-lost 1968 BBC radio dramatization. Boeing, the manufacturer of 777 aircraft above that featured Smaug. The CGI simulation of Smaug used in Peter Jackson's films, voiced by Benedict Cumberbatch, made a guest appearance on the satire show The Colbert Report on December 11, 2014, to promote The Hobbit: The Battle of the Five Armies. During the interview, Smaug favored the United States returning to the gold standard, supported stand your ground laws, and endorsed Rand Paul to run for President of the United States in 2016. He also claimed to have turned down a role on Sherlock because he didn't want to "play second fiddle to that hack Cumberbatch", before going on a rampage after Colbert made light of a scene from the movies. Smaug later made a non-speaking cameo in the series' final episode, joining the series' other previous guests in a rendition of "We'll Meet Again". In 2011, scientists in the United States and South Africa named a genus of southern African girdled lizards, Smaug, after the character (the lizards were originally part of the genus Cordylus but reclassified after molecular phylogeny studies). The lizards were so named after the fictional dragon due to being similarly armoured, dwelling underground, and native to Tolkien's birthplace - Bloemfontein, Orange Free State, which is now Free State province, South Africa. In 2015, a new species of shield bug was named after Smaug, Planois smaug, because of its size and its status "sleeping" in the researcher's collections for about 60 years until it was discovered. The ant species Tetramorium smaug is named after the fictional dragon. ^ Tolkien, J. R. R. "Appendix E – Writing and Spelling: I. Pronunciation of Words and Names". The Lord of the Rings. : "All these diphthongs were 'falling' diphthongs, that is stressed on the first element, and composed of the simple vowels run together. Thus ... au (aw) as in loud, how and not laud, haw." ^ Tolkien, J.R.R. (1937). "An Unexpected Party". The Hobbit. Boston, Massachusetts: Houghton Mifflin Harcourt. p. 6. ISBN 978-0547928227. ^ Hammond, Wayne G.; Scull, Christina, eds. (2011). The art of the Hobbit. London, England: HarperCollins. ISBN 978-0007440818. ^ Tolkien, J. R. R. (1983). Tolkien, Christopher (ed.). Beowulf: The Monsters and the Critics and Other Essays. London, England: George Allen & Unwin. ISBN 0-04-809019-0. ^ Garth, John (9 December 2014). "Tolkien's death of Smaug: American inspiration revealed". The Guardian. London, England: Guardian Media Group. Retrieved 1 July 2014. ^ Bosworth, Joseph; Bosworth Northcote, T. (2018). "smúgan". An Anglo-Saxon Dictionary (Online). Prague: Charles University. ^ Fleming, Mike Jr. (June 16, 2011). "Benedict Cumberbatch To Voice Smaug in 'The Hobbit'". Deadline. New York City: Penske Media Corporation. Retrieved June 19, 2011. ^ Cassell, Amy (18 December 2013). "15 Questions From Last Week's David Farmer ('The Hobbit') Facebook Chat". Full Sail University Blog. ^ Truitt, Brian (December 16, 2013). "Five things to know about scaly 'Hobbit' star Smaug". USA Today. Mclean, Virginia: Gannett Company. ^ Hughes, Mark (December 8, 2013). "Review - 'The Hobbit: The Desolation Of Smaug' Is Middle-Earth Magic". Forbes. New York City: Forbes Media. Retrieved July 1, 2018. ^ Corliss, Richard (December 9, 2013). "'The Hobbit: The Desolation of Smaug': It Lives!". Time. New York City: Meredith Corporation. Retrieved July 1, 2018. ^ De Semlyen, Nick (6 December 2013). "The Hobbit: The Desolation Of Smaug Movie Review". Empire. London, England: Bauer Media Group. Retrieved 1 July 2018. ^ Wigler, Josh (December 9, 2013). "'The Hobbit' Reviews: Get The Scoop On 'Smaug'". MTV.com. New York City: Viacom. Retrieved July 1, 2018. ^ Noer, Michael (23 April 2012). "How Much is a Dragon Worth, Revisited". Forbes. Retrieved 8 July 2012. ^ "Smaug". Forbes. 2012. Retrieved 8 July 2012. ^ "Smaug". Forbes. 2013. Retrieved 31 July 2013. ^ "Protect and Prosper". American Museum of Natural History. Retrieved August 30, 2015. ^ Stanley, Edward L.; Bauer, Aaron M.; Jackman, Todd R.; Branch, William R.; Mouton, P. Le Fras N. (2011). "Between a rock and a hard polytomy: Rapid radiation in the rupicolous girdled lizards (Squamata: Cordylidae)" (PDF). Molecular Phylogenetics and Evolution. Cambridge, Massachusetts: Academic Press. 58 (1): 53–70. doi:10.1016/j.ympev.2010.08.024. PMID 20816817. ^ Faúndez, Eduardo (June 19, 2015). "Patagonian Shield Bug Named After Middle's Earth's Smaug the Dragon". Entomology Today. Annapolis, Maryland: Entomological Society of America. Retrieved March 20, 2016. ^ Carvajal, Mariom A.; Faúndez, Eduardo I.; Rider, David A. (2015). "Contribución al conocimiento de los Acanthosomatidae (Hemiptera: Heteroptera) de la Región de Magallanes, con descripción de una nueva especie". Anales Instituto Patagonia (Chile). Patagonia, Chile. 43 (1): 145–151. doi:10.4067/s0718-686x2015000100013. Archived from the original on 2015-06-22.